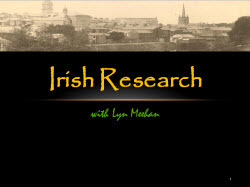 Irish genealogy can present a conundrum over other ethnic research in terms of finding key resources to continue the family tree. Its historical ‘terrible beauty’ interwoven with the mass destruction of Four Courts is eternally written. Still, those family historians possessing optimism and enthusiasm, equipping themselves with quality resources and endurance can march on to the beat of a different drum overcoming hurdles by such tragic loss. What genealogical resources to confront in Canada and/or in the U.S.